Today on World Elephant Day seven companies, including eBay, Etsy, Gumtree, Microsoft, Pinterest, Tencent and Yahoo! have united to adopt a new policy framework that will help protect animals from illegal online trade. The International Fund for Animal Welfare (IFAW) has been battling online wildlife crime since 2004 and I personally have led the fight for the last five years. During that time we have seen company after company step up and change their policy but now we have reached a crucial tipping point. Today we are building a strong, steadfast wall designed to keep wildlife criminals out of these online platforms and prevent illegal trade being displaced onto other online sites. Why is it so important for online tech companies to have policies in place to deter would be wildlife cybercriminals from trading on their sites? Well, our brief six week survey of 280 online marketplaces across just 16 countries showed that there were more than 30,000 live endangered and threated wild animals and their body parts for sale online. The cost of these items was conservatively estimated to be worth more than 10 million US dollars. If you’re like me those numbers may seem a little overwhelming and abstract, but just think: during a time when one elephant is being killed every 15 minutes to supply the illegal trade in ivory trinkets, we found thousands of pieces of ivory in just this one investigation. In fact, 32 percent of the advertisements found were for ivory and suspected ivory (where traders use code words to disguise the item). Not all of this online wildlife trade is illegal – you can trade some endangered species if you have the necessary permits in place – but few sellers post or refer to these permits, and the internet gives unscrupulous criminals access to vast markets where the chances of being caught have been far too slim. This is why we need the help of large international companies. The online marketplace is so large that everyone needs to do his or her bit to close down the avenues for wildlife cybercriminals. Today’s message from online tech companies will also help to increase awareness of the need to reduce the demand for these products online. This is crucial because many consumers are not aware that by purchasing these animals or their products they are threatening their survival in the wild, or that by engaging in illegal wildlife trade (even ignorantly) they risk being hit with severe penalties. We have been working in partnership with TRAFFIC and the World Wildlife Fund (WWF) to support these big online companies, as we are aware that a change in policy by itself will not be the silver bullet we seek. Together we will continue to empower them to enforce their policies, but we also need you, as the consumer or the conservationist, to be our eyes and ears and report suspicious posts to those websites. 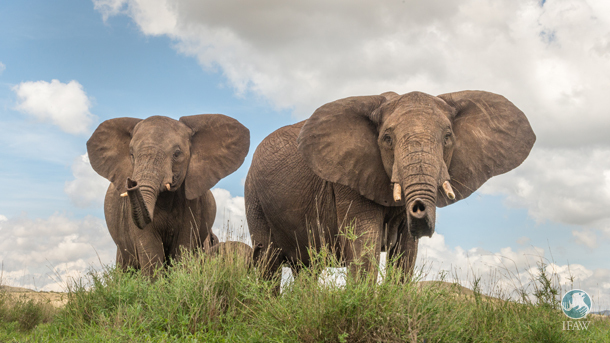 The online tech companies are an important part of the solution to this problem, but IFAW also remains committed to working with enforcers to ensure those breaking the law are brought to justice. IFAW is also asking governments to review and strengthen their legislation to specifically tackle wildlife cybercrime, and in just the last few months we have seen both China and France introduce new regulations to clamp down on this illegal trade. I have seen a room where an online trader had the body parts of endangered wildlife stacked from floor to ceiling, wall to wall. These images haunt me. By working together with online tech companies, non-government organisations, enforcers and governments we have every intention of make such horrors become a thing of the past.